The Patriotic Union of Cuba, or UNPACU, is perhaps the most active and most effective opposition groups in Cuba. And as a result, it's also one of the Castro dictatorship's biggest targets for repression, with members frequently targeted for harassments, threats and arrests. On Wednesday, in Santiago de Cuba, two UNPACU activists in jail for several months, were tried, convicted and sentenced to time in the Castro gulag because of their anti-government activities, according to Roberto Guerra with Hablemos Press news agency. Ernesto Roberto Riveri Gascón was sentenced to 1 year in jail for "public disorder," "contempt" and "assault" -- charges the regime frequently lodges when it wants to put an activist out of commission. Getting five years in prison was Enrique Figuerola Miranda, who before his arrest at his home on July 27, 2012, was considered one of the most effective activists in UNPACU. He was conviced on a charge of "assault." While in jail Figuerola has carried out numerous hunger strikes, including one that lasted 60 days, to demand his release. The regime's true intentions are revealed in how it managed the trials for the two activists. "Four women of the Ladies in White Movement could enter the court, but five people were detained to block them from attending the hearing," said UNPACU activist Aurora Sancho. 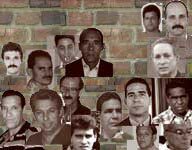 In all, 33 UNPACU activists are sitting in Cuban prisons. For more on the story, listen to the Radio Marti report.